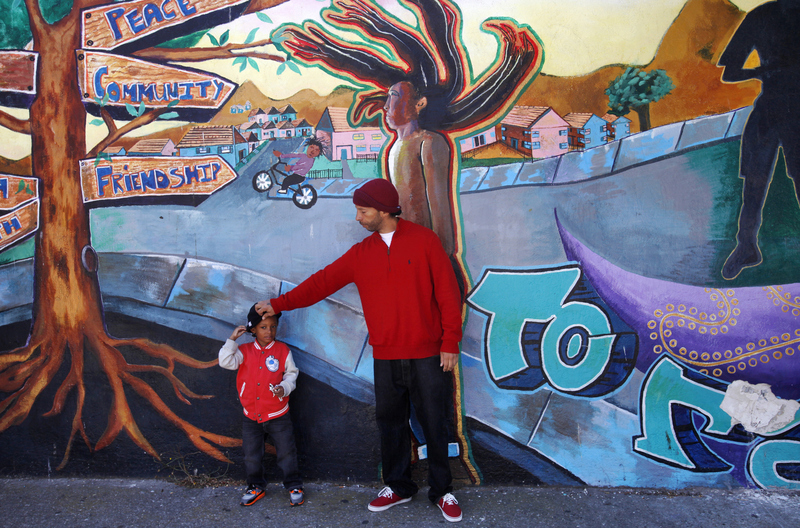 Sekou Carson adjusts the hat on his son Zakai Carson, 4, as they lean up against a community mural titled "How Do You Shine" while the two were out for a walk during Sekou\'s visit to the neighborhood to see his son July 3, 2014 in the Visitacion Valley neighborhood in San Francisco, Calif. "My heart goes out to him and his family," Sekou said of the shooting, adding that he didn't feel the neighborhood was more unsafe now. "I think it was an isolated incident," he said. Last Friday, June 27, outreach counselor Allen Calloway was shot and killed while playing dodgeball with children at a basketball court near Herz playground in Visitacion Valley. Since then, the summer program held at the playground has been closed temporarily and the area has had much fewer children and residents using it.